Have you discovered Quebec garlic? 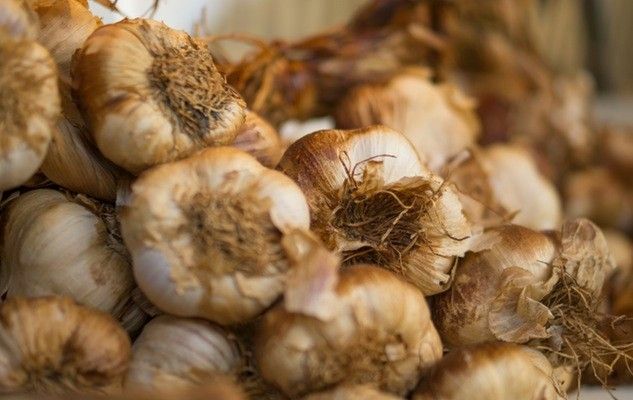 Native to Central Asia, garlic has been cultivated for over 5,000 years. The Egyptians included it in the daily diet of the slaves building the pyramids, as they believed it had strengthening properties. For the same reason, Greek athletes used to eat garlic before competitions and Roman soldiers consumed it before going into battle. Garlic also has a reputation for warding off evil: it supposedly keeps away vampires, zombies and even the devil! Personally, I feel that these myths are linked to the strong breath you get when you eat it! Medical research has confirmed that garlic does have certain medicinal properties. However, at least 1 or 2 cloves of it would have to be consumed daily for the therapeutic effects to kick in. Garlic that is sold in our grocery stores usually comes from the world’s largest producer, China, except during this period of the year, when we can find garlic produced in Quebec. I invite you to taste the difference: in my opinion, the higher cost of Quebec garlic is largely compensated by the fact that it is much tastier, juicier and easier to digest than the imported variety. It is also much healthier, since very little or no pesticide is used in the cultivation. It is also exempted from anti-germination treatment. So if you like it, stock up on it: select intact and firm bulbs and store them in brown paper bags in a cool, dry place or hang them in braids in your kitchen. You’ll be able to keep them like this all year long. Originally published in the Journal de Montréal on August 30, 2008.